NEW YORK--(BUSINESS WIRE)--Dubbed the new “civil rights movement”, #BlackLivesMatter launched a transformative grassroots movement that moved from social media to the streets across America. As news and images of the senseless deaths of Trayvon Martin, Eric Garner, Michael Brown, Freddie Grey and others spread online, a new generation of civil rights activists came together demanding institutional change. From scheduled marches, to assembled sit-ins and to heated rallies across the country, protesters and communities pushed the hashtag #BlackLivesMatter into a worldwide rallying cry. This is the real story of brave young people who have found their voice to lead a powerful social movement. Now these activists face the daunting challenge of turning protest - into lasting change. 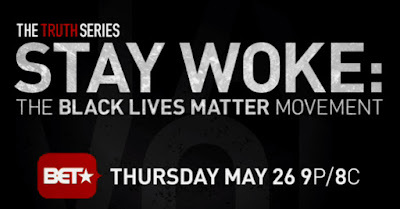 Directed and produced by Laurens Grant (Black Panthers - Vanguard of the Revolution) and executive produced by actor/activist Jesse Williams (Grey’s Anatomy) the BET original documentary STAY WOKE: THE BLACK LIVES MATTER MOVEMENT,” will have its broadcast premiere on Thursday, May 26 at 9 PM ET/PT. Launched in July 2015, BET’s The Truth Series features original documentary films, directed by award-winning filmmakers that showcase stories about the African-American experience. The 2015 BET Truth Series documentary film ALI: The People’s Champwas recently honored with the 2015 NAACP Image Award for best documentary and Katrina 10 Years Later: Through Hell and High Water was awarded the 2016 NAMIC Vision Award for best documentary film.